This Article has been rendered to PUFOI and UFO-PSI with permission by "Peter B. Davenport", Director of National UFO Reporting Center. Copyright 2004 Peter B. Davenport All rights reserved. The author proposes a system for the remote, real-time detection of UFO's in the near-Earth environment, using passive, multi-static, frequency-modulated (FM) radar. The system capitalizes on the use of multiple, time-synchronized radio receivers to capture high-frequency radio signals reflected from a target. The time-lapse between received signals, together with three-dimensional Doppler-shift analysis, permits calculation of a target's location, velocity, acceleration, flight path, and other parameters, possibly to include target size estimation. Signal analysis of the reflected signal, combined with analysis of target characteristics, will permit discrimination between suspected UFO's, and targets of terrestrial origin, e.g. aircraft, satellites, space debris, meteor trails, upper atmospheric conditions, weather phenomena, migratory birds, the Moon, etc.. One application proposed may allow detection of UFO's out to a range of at least 27,600 kilometers from the Earth's surface. The national debate over whether UFO's are a real objects, i.e. sophisticated, extraterrestrial craft under intelligent control, was sparked on June 24th, 1947, by the now famous sighting of a cluster of disc-shaped objects near Mt. Rainier in Washington State by Mr. Kenneth Arnold, a former World War II fighter pilot. Upon landing at Pendleton, OR, after his sighting, Arnold was interviewed by reporters, to whom he reputedly described the objects as "saucers," a statement which quickly gave rise to the term, "flying saucer." Whether personnel in the U. S. Government were aware of the existence of UFO's, and of their significance, prior to the Arnold sighting is unclear. However, the reports by air crews during World War II of "Foo Fighters," peculiar objects seen to pace military aircraft over Europe, must have captured the attention of senior military and intelligence personnel, even if those personnel were unaware of their cause or origin. Since those early events, the field of UFO investigation has relied primarily on eyewitness accounts, hundreds of thousands of which have been collected by UFO investigators and organizations over the last 57 years. Some of those sightings have been supplemented by photographic evidence, physical trace evidence, or radar data, the latter collected almost exclusively by government agencies, e.g. the Federal Aviation Administration, the National Weather Service, or military facilities. Many radar intercepts of suspected UFO's have been captured since the early 1950's, but because of the limitations of traditional radar, those events have not been convincing, to everyone's satisfaction. This is not a technical paper. 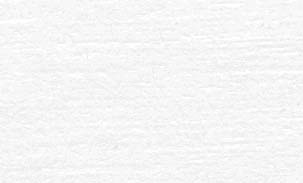 Rather, it is intended to convey a general concept to a non-technical community of readers in the field of UFO research. Its principal purpose is to alert the UFO community to the fact that new developments in passive, multi-static radar, and in related technologies, will permit, for the first time in the history of ufology, remote, real-time detection of UFO's in the near-Earth environment. Moreover, not only will the proposed system detect the presence of suspected UFO's, but also, it will permit determination of their flight characteristic, e.g. velocity, acceleration, flight path, and perhaps size. The technology described here is not theoretical. Rather, it already exists, it is relatively inexpensive, and it does not require a great deal of technical acumen to operate. Passive radar is a quantum improvement over traditional radar, with regard to its capability to detect fast-moving targets, and targets at large distances. The author does not fail to recognize that this paper may cause some discomfiture in certain circles within the U. S. government, and perhaps elsewhere. The technology addressed here will permit detection of UFO's in the vicinity of our planet, if in fact such objects exist, and if they reflect electromagnetic radiation. This new technical capability may represent a challenge to the traditional monopoly that the world's governments seem to have enjoyed with regard to "hard" evidence surrounding the possible visitation of Earth by alien life forms. In brief, the technology may allow the resolution of the question as to the existence of UFO's. Electromagnetic Radiation-A term synonymous with "radio waves." Radio waves can vary in frequency, with the higher frequency radio waves having shorter wavelength, and lower frequency radio waves having a longer wavelength. All radio waves propagate at the speed of light. Examples of electromagnetic radiation are radio and television signals, microwaves, infrared, visible light, ultra-violet, X-rays, gamma rays. All of these forms of electromagnetic energy differ only by virtue of their respective frequencies. Radar-Any system that uses reflected electromagnetic radiation to detect the presence of an object. Analysis of the reflected radio signal can be used to calculate certain characteristics of a target. Active Radar--Traditional radar employs 1) a transmitter, which radiates a (usually) narrow beam of radio waves, and 2) a receiver, which detects the reflected signal. Passive Radar-A type of radar system which uses one (or more) receiver(s), but which has no active transmitter. The system detects ambient radio signals, emanating from nearby radio transmitters. Potential sources of electromagnetic radiation that can be exploited by a passive radar system include 1) commercial radio and television signals, 2) signals from cell telephone towers, 3) sources from space-borne platforms, and others. Mono-static Radar-A radar system in which the transmitter and receiver are 1) stationary, and 2) located at the same position. Bistatic Radar-A radar system in which its elements, either the transmitter(s), and/or receiver(s), are 1) stationary, and 2) in different locations. Multistatic Radar-Similar to bistatic radar, except that it employs more than two stationary transmitters and/or receivers. Frequency Modulation (FM)-Alteration of the frequency of a transmitted radio signal. Amplitude Modulation (AM)-Alteration of the amplitude of a transmitted radio signal. Signal Analysis-Measurement of various characteristics of a radio signal, to include its shape, duration, time of transmission or intercept, etc.. Many aspects of a signal can be measured quite accurately, and very quickly, by modern electronic circuitry. Doppler-shift Analysis-Measurement of the shift in frequency of a reflected radio wave, caused by the motion of the target either toward, or away from, a receiver or transmitter. Often, the frequency-shift usually is very small, but it nevertheless can be measured quite accurately. Phased-Array Antenna-A type of antenna, which employs a number of small elements, instead of a single, large element. Phased-array antennas can be used either for transmitting, or receiving, a radio signal. By precise timing of when each of the individual elements transmits its respective portion of a radio signal, the direction in which the overall signal is transmitted can be precisely controlled. If the time at which a signal is received by each element in a receiver array is measured precisely, the direction from which the signal was transmitted (or reflected) can be measured. Continuous Wave-A radio signal, which is transmitted as an un-modulated sine wave. Hence, its frequency is constant. Global Positioning System-A system, referred to as "GPS," which allows very precise determination of location. The system employs time-synchronized radio signals transmitted from overhead satellites, which allows very precise determination of not only position, but time, as well. The system uses very precise time-lapse measurement to calculate the distance from each of several transmitting satellites, which, in turn, permits very precise calculation of the distance from each of the satellites transmitting the signal. The principle of radar employs the fact that some materials reflect electromagnetic radiation ("ER"). Examples of objects that reflect ER are most metallic items, the Earth's ionosphere, ionized "trails" behind meteors, satellites, re-entering space debris, the Moon, the surface of the Earth, migratory birds, etc.. Many materials, e.g. air, wood, plastic, most glass, etc., may not reflect electromagnetic radiation. Whether a target reflects a radar signal can depend on its size, the material it is made of, and the frequency of the impinging electromagnetic radiation, etc..
Radar technology has become dramatically more sophisticated since its invention during the 1930's, but traditional "active" radar, which uses a co-located transmitter and receiver, operates fundamentally the same as it did over half a century ago. The transmitter radiates usually a very narrow, high-power beam of radio waves, which is scanned over the target area. When the beam strikes a target, if the transmitted signal is reflected by the target, that reflected signal is detected by the system's antenna and receiver. With signal analysis of the reflected wave, azimuth and elevation of the target can be calculated. In addition, the range to the target can be calculated from the elapsed time required for the signal to reach the target and return to the receiver antenna. Given that active radar requires both a transmitter and receiver, an active radar system usually is expensive and bulky. Because an active system requires a high power output, it is expensive to operate. Most active radar systems are not easily portable. When an active radar system is in operation, its transmitter is easily detectable. Operation of the transmitter requires an FCC operator's license. Detection of a target often is intermittent, e.g. every few seconds, not continuous. Range and altitude data usually are limited by the power of the transmitter. Some systems require multiple transmitters and/or receivers for obtaining three- dimensional information. "Raw" radar returns often have to be filtered, in order for an operator to be able to make sense of them. An active system can be defeated by ground clutter, or debris in the atmosphere. False signals, called "aliases" or "ghosts," can appear in the system, making interpretation difficult. Several of the characteristics listed above combine to limit the effectiveness for detection of UFO's with traditional, active radar. The intermittent nature of the system, i.e. illumination of the target only very briefly every few seconds, limits the system's ability to identify some targets unambiguously. If the target moves a large distance between subsequent detections of the target, for example, the system operator might conclude that the target is an anomaly, i.e. an "alias" or "ghost" return, and not realize its significance. In addition, the expense of building and operating such a system can be prohibitive for the average researcher, and operation of a transmitter requires a federal license. Except for low-power navigational radar systems on private boats and aircraft, most radar systems in the United States are operated by government agencies. Hence, government employees are often the only ones to see the radar data collected by present-day, active radar systems, and the information may not be freely available to the public. Although there are many instances in the UFO archives of detection of UFO's by active radar, such intercepts are relatively few, compared to the number of eyewitness accounts of reported UFO sightings. Hence, there is considerable room for improvement in radar detection of UFO's, beyond what has been possible over the last half century with traditional, active radar systems. The concept of passive radar detection, using reflected ambient radio signal emanating from a distant transmitter, is not a new concept. The idea was first addressed seriously as early as the 1950's. The fact that various U. S. Government agencies have been interested, for decades, in the possibility of detecting aerial or surface targets by using passive radar is indicated by the conferences held during the late 1960's, and the research projects that those conferences addressed. The Project "May Bell" Technical Workshop, sponsored by Raytheon Company, and held in Burlington, MA, on May 18-22, 1970, is evidence of an early interest in this the application of passive radar. The list of attendees of that conference reads like a "Who's Who" of the defense and intelligence communities. One of the subordinate projects within Project "May Bell" that was discussed at that conference was "Project Aquarius," sponsored by the Advanced Research Projects Agency (ARPA Order No. 1459), and conducted by the Sylvania Electronic Defense Laboratories, Mountain View, CA. "Project Aquarius" was a research project, designed to test the feasibility of detecting submarine-launched ballistic missiles and low-flying aircraft, using a bi-static, passive radar system. Figure 1: Cover pages of the Project "May Bell" Technical Workshop and Project "Aquarius" Quarterly Report ( 1970). The fact that interest in passive radar for defense applications continues into the 21st Century is indicated by the Third Multinational Conference: Passive and Covert Radar (PCR: 2003), held at the Applied Physics Laboratory, University of Washington, Seattle, Washington, on October 21-23, 2003. The attendees included personnel from the Office of the Secretary of Defense, the Defense Intelligence Agency, the U. S. Air Force Research Laboratories, the U. S. National Intelligence Council, NATO, the Lockheed-Martin Company, The Boeing Company, and from several U. S. and foreign academic institutions. The ranks and titles of personnel present at that conference underscore the professional interest in passive radar, and the fact that it is a technology that today is being viewed as having become technically feasible. Figure 2: From a website announcing the University of Washington symposium on passive and covert radar, held October 21-23, 2003. Passive radar requires no active transmitter, only multiple receivers. A passive radar system detects targets continuously, often, multiple times per second. A passive radar system cannot be detected when in operation, since it has no active transmitter as an element of the system. Passive radar can detect targets over a wide area, whose radius often is measured in hundreds, or thousands, of kilometers. A passive radar system is relatively inexpensive, requiring nothing more than a receiver, a very accurate time source, and adequate signal processing capability. Construction and operation of the system requires no government licenses, and therefore, is not controlled by any governmental licensing agency. A passive system can be operated in virtually any location. The principal hurdle encountered in the development of sophisticated passive radar systems has been having enough computer computational power be able to process very large volumes of data. Real-time signal processing for a small-scale passive system, using two receiver stations, typically requires computer computational capacity in excess of 10-giga operations per second (GOPS). Such computational capacity has become available only relatively recently. Hence, computational capacity no longer is a limiting factor, a fact which has given rise to renewed interest in passive radar systems for applications other than just large-scale military purposes. The relatively recent deployment of the U. S. Global Positioning System is another development that has made passive radars feasible. GPS allows very accurate time measurement, which is a necessary for very precise time synchronization of radio receivers. The GPS system also allows very accurate measurement of the location of receiver antennas. The Moon-The U. S. Navy began experiments in 1954, designed to bounce radio signals off of the surface of Earth's moon. 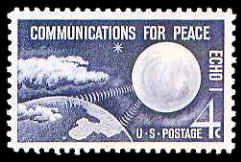 The project was called "Communication by Moon Relay" ("CMR"), and its principal objective was to allow direct radio communication between Washington, D.C., and Hawaii. Echo I and II-The Echo I and II satellites, little more than gas-filled balloons with an aluminized coating, were launched by NASA on August 12, 1960, and January 25, 1964, respectively. The purpose of the project was to create a high-altitude (800-900 km) "reflector" for radio transmissions emanating from surface-based transmitters. The satellites permitted "skipping" a transmitted signal to a remote receiver at a location over the horizon from the transmitter's location. Figure 3: Postage stamp issued to commemorate the launching of Echo I. Note simulated radio signals being reflected off the surface of the satellite. Over-the-Horizon Radar--Military agencies have been interested in the concept of increasing the range of a radar system by reflecting a transmitted radar signal off the Earth's ionosphere (e-region), thereby projecting it a signal to targets over the horizon. Projects designed to achieve that goal have experienced varying degrees of success. Meteor-Scatter Communications Technology--Ham radio operators have known for years that the ionized trails of hot gas, generated by meteors entering the Earth's atmosphere, could be used for as short-lived, e.g. 1-5 seconds, reflection points for transmitting radio signals over the horizon to a distant receiver. The system has been in use for many decades, and commercial technologies have been built on the principle of using ionized trails behind meteors for bouncing radio waves to distant receivers. Meteor Communications Corporation, Kent, WA, has built "meteor-scatter" systems since 1975. U. S. Space Command--The U. S. Navy operates an extensive radar system, often referred to as "The Fence," elements of which stretch from San Diego, CA, to Ft. Stewart, GA. The system is designed to detect, and measure, the trajectories of objects in Earth orbit. The transmitters radiate an extremely high-power (768 kW radiated power), high-frequency (216.98 mhz) continuous-wave ("CW") radio signal, which is broadcast through a series of phased-array antennas, forming a thin "fan" of electromagnetic energy, radiating out into space above the Earth. When an orbiting object penetrates the radiated beam, the signal reflected by the object is recorded by multiple, time-synchronized receivers on the surface. The system is reported to be sensitive enough to be able to detect an object 10 centimeters in diameter out to a distance of 27,600 kilometers from the surface, a distance equal to approximately two Earth diameters. Presumably, larger objects can be detected to a considerably greater distance. Lockheed-Martin "Silent Sentry" Passive Surveillance System-A passive, all weather surveillance system, designed to detect targets using reflected radio signals from commercial FM radio stations. The system was first announced in 1998, and was awarded the Aviation Week & Space Technology "Technology Innovation Award" in 1999. University of Washington Passive Ionosphere Imaging Radar System-The University of Washington Department of Electrical Engineering maintains a passive FM radar system for imaging small-scale fluctuations the Earth's ionosphere, a project supported by the National Science Foundation. The system employs commercial FM radio signals (88 to 108 mhz) as a source, which are reflected off the ionosphere and detected by receivers several hundred miles distant, on the opposite side of the Cascade Mountains. A detailed technical description of a passive, multi-static radar system is beyond the scope of this paper. However, an attempt is made below to describe in general terms, and step by step, the operational elements of a passive radar system. A sensitive FM receiver, designed to detect a radio signal, typically in the 30-230 mHz frequency range, depending on the type of target to be detected. A modern, high-speed computer with sufficient capability to record a large number of intercepts per second, and to perform very rapid signal processing. Appropriate software for rapid signal processing, to include calculation of three- dimensional Doppler-shift information. Access to GPS equipment for accurate time and position measurement. Knowledge about, or access to, the original transmitted radio signal. 1) Multiple receiver antennas are deployed, such that they are shielded from direct, line-of-sight communication with the FM transmitter of choice, but which are able to detect any reflected signals from the target area. 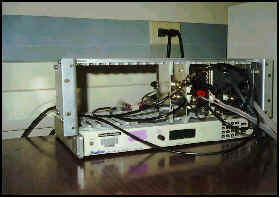 2) The system antennas are connected to a radio receiver, which is tuned to the original transmitter frequency. 3) Accurate time-measuring equipment (usually from the GPS system) is applied, such that the time of arrival of a reflected signal at each receiver antenna can be measured very accurately. 4) The precise frequency of each of the reflected signals received by each of the receiver antennas is measured and recorded. Once an intercept of a reflected signal is recorded, a process that can be effected hundreds or thousands of times per second, the intercepted signal can be analyzed in a number of ways, in order to extract information from the signal. 5) The time that a reflected signal is intercepted at each of the respective multiple antennas can be applied to triangulate the location of the reflected signal. 6) Multiple calculations of location of the target can be applied to calculate velocity, acceleration, and flight path of the target. 7) Any very subtle shift in frequency (Doppler-shift) of a reflected signal, caused by the movement of the target relative to the location of a fixed antenna, can be compared with the frequency of the original transmitted signal in order to calculate velocity of the target. Once data are obtained for any given target or event, these data then can be used for analysis of what the source, or cause, of the reflected signal might have been. Probably the most useful elements information for determining what may have been the nature of a target are its location, elevation, duration, velocity, acceleration, and flight path. Analysis of any one of these parameters might be sufficient to rule out the likelihood of one, or more, categories of targets. For example, migratory birds would not be expected above a certain altitude or velocity. Similarly, most aircraft would be observed below a certain altitude, and would not be expected to be stationary. A meteor would not be stationary. Other categories of targets could be ruled out by similar lines of reasoning. A typical bi-static system is illustrated in Figure 5. It indicates 1) exploitation of a commercial FM transmitter, 2) the shielding (by a landmass) of the remote receiver from the transmitter, 3) access to the original transmitted signal, and 4) the path of a reflected signal. A multi-static system has at least three receiver sites, necessary for three-dimensional triangulation to the reflection point, and also to allow calculation of Doppler-shift in three dimensions. Figure 6 illustrates a multi-static passive system, which 1) employs two transmitters, and 2) two sets of four antennas for each station. As the number of transmitters and receivers is increased, the amount of information generated by the system grows rapidly, and the amount of computational capacity grows exponentially. Given the large number of high-power commercial broadcasting stations in the United States, they offer a readily available source of broadcast FM signal (88-108 mHz, for radio) for use by a typical multi-static radar system. Pre-requisites for operation of a passive radar system are that 1) the signal processor have access to the original broadcast signal, which serves as a reference, and 2) that the transmitter not be "visible" by the receivers, i.e. it is over the horizon from the receivers, or somehow "shielded" from them. With the receiver tuned to the operating frequency of any broadcasting station, intercepts by the system can be ascribed to a nearby reflection point, either in the atmosphere, or on the surface. Comparison of the received signal with the original broadcast signal will provide information as to the nature of the target. With sufficient signal analysis capability, location of the target, its velocity, acceleration, and flight path, and perhaps estimates of its size, should be able to be calculated. This information should be adequate for performing discrimination between different types of targets. The nature of the phased-array transmissions used by the U. S. Navy Surveillance System for detecting and tracking orbiting objects makes it ideal for amateur tracking of targets in the near-Earth environment, or beyond. The system transmitters broadcast a very high-power (768 kW), high frequency (216.98 mHz) continuous-wave signal, which should permit of easy detection, and high-resolution, of objects in the vicinity of the system's three transmitters. Given that the system is designed to permit the detection of a target approximately 10 centimeters in diameter out to a distance of 27,600 kilometers, detection of a target whose diameter is on the order of ten meters out to that range would be a trivial process. 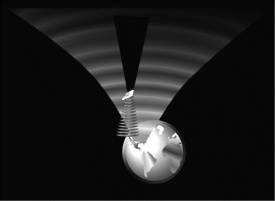 Personnel at the University of Washington, Seattle, have developed a working bi-static radar system, sponsored by the National Science Foundation, for meter-scale imaging of the e-region of the Earth's atmosphere. The system may be able to be duplicated, and adapted, for tracking objects in the near-Earth environment. The system probably would have to be transformed into a multi-static system, with multiple antennas, in order to permit three-dimensional imaging capability, and the signal processing capability might have to be expanded dramatically to permit real-time processing of rapidly moving targets. However, with sufficient resource and technical personal, such a project seems feasible. Within recent decades, because of both 1) the advent of high-speed computers, and 2) the deployment of the Global Positioning System, passive, multi-static radar systems have become technologically feasible. Passive radar technology has developed to the extent that it is now being discussed for use not only in defense and intelligence applications, but in the civilian sector, as well. The day is rapidly approaching, or perhaps has already has arrived, when the UFO community will have the technical ability to operate radar systems, which should allow unambiguous determination as to whether UFO's visit the near-Earth environment. Whereas some projects, dedicated to detecting intelligent life in the Universe, cost tens of millions of dollars per year to operate, a system of multi-static, passive radar receivers may permit detection of UFO's for vastly less expense. If the application of passive radar for detecting UFO's is successful in confirming their existence in the near-Earth environment, the application of new technology proposed by this paper will serve to challenge the apparent monopoly that the U. S. Government, and other governments, presently enjoy with regard to knowledge of that fact. Governments no longer will be able to conceal the existence of the UFO phenomenon from the world community. Many individuals, companies, and institutions contributed to my understanding of the subject of passive radar, and to the preparation of this paper. I owe a large debt of gratitude to all them, as well as to others, who made minor contributions. I list below the major contributors in the order in which they appeared on the stage of this production: Mr. Fred Johnson, Enumclaw, WA; Meteor Communications Corporation, Kent, WA; Mr. Robert B. Frost, Seattle, WA; Christian Stepien, NUFORC webmaster, Seattle, WA; Dr. Donald Johnson, Ph.D., Seattle, WA; Mr. Mark Cashman, State Director (former), MUFON/Connecticut; Mr. Robert S. VunKannon, Kennewick, WA; Prof. John Sahr, Ph.D., Dept. of Electrical Engineering, University of Washington, Seattle, WA; Mr. Jim Klotz, Computer UFO Network ("CUFON"), Seattle, WA; Mr. Ray-Paul Nielsen, Illustrator, Seattle, WA. Davenport, P. B., On Detecting UFO's with "Meteor-Scatter" Communications Technology, The MUFON Journal, No. 379, November 1999. Hall, P.W., Correlative range - Doppler detectors and estimators in bistatic radar using commercial FM broadcasts, MS thesis, Univ. of Wash., Seattle, 1995. Hansen, J.M., A new radar technique for remote sensing of atmospheric irregularities by passive observation of the scattering of commercial FM broadcasts, MS thesis, Univ. of Wash., Seattle, 1994. Lind, F. D., J.D. Sahr, and D.M. Gidner, First passive radar observations of auroral E region irregularities, Geophys. Res. Lett. Vol. 26 , No. 14 , July 15, 1999; p. 2155. Proceedings of the "May Bell" Technical Workshop, Publ. By the Raytheon Company Spencer Laboratory, Burlington, Massachusetts, May 18-22, 1970. Sahr, J.D., and F. D. Lind, The Manastash Ridge radar: a passive bistatic radar for upper atmospheric radio science, Radio Science. Vol.32, No.6; Nov.-Dec. 1997; p.2345-58. Standley, R., Snow, K., Project Aquarius Quarterly Report (U), Sylvania Electronic Defense Laboratories, Mountain View, California, March 2, 1970. Copyright Peter B. Davenport 2004. All Rights Reserved. Permission granted to MUFON for publication in Proceedings for 2004 Symposium. � 2003-2009 Project UFO Int'l. All Rights Reserved. � 2000-2009 UFO & Paranormal Studies Int'l. All Rights Reserved.